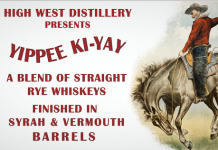 The flavored whiskey category is a very tough nut for spirit companies to crack. There’s a significant amount of velocity and enthusiasm over the category, but only a handful of products have really been able to capture the lion’s share of the business. Three standout products have really been able to dominate this space: Jack Daniel’s Tennessee Honey, Crown Royal Maple and Sazerac’s Fireball. The problem is that the success of these products doesn’t necessarily seem to be tied to their flavor. 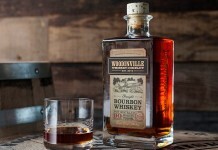 Many other major companies have given a solid effort at cracking the honey, maple, and cinnamon flavored whiskey space with lackluster results, including Jack Daniel’s, whose Tennessee Fire, although in limited release, isn’t garnering nearly the buzz that their Tennessee Honey did. Jim Beam has also made significant efforts to crack the flavored whiskey code with Jim Beam Honey and Jim Beam Maple, and although they’ve been well received, neither of them have been able to touch Fireball. For Jim Beam, getting a better foothold in the flavored whiskey space is extremely important. Prior to Fireball’s smash hit, Jim Beam’s Red Stag flavored whiskey was enjoying a king of the hill status in the category. Red Stag isn’t going anywhere, but the buzz has clearly shifted over to Fireball. In an effort to help reclaim some of that space, Jim Beam is releasing Jim Beam Kentucky Fire, following a similar track that Jack Daniel’s did with their Jack Daniel’s Tennessee Fire by releasing the product in a few select markets quietly before doing any major national roll out. This style of releasing spirits is very millennial friendly, as it helps give them the opportunity to feel like they’ve “discovered” something new on their own, and champion it to their social networks who hopefully like, share, snapchat, etc. This kind of understated, millennial-focused marketing is sure to become a much more common method of rolling certain spirits out, especially ones targeted to the 21-25 age range. The problem with trying to take on Fireball is that it’s a brand that has superseded its own category. Fireball isn’t necessarily seen as “flavored whiskey”, it’s just Fireball, in many of the same ways that Crown Royal isn’t always seen as Canadian whisky, it’s just Crown Royal. 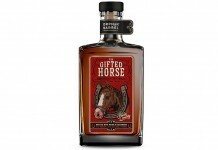 Jim Beam Kentucky Fire (35% ABV / 70 proof, $15.99) – as with many of their recent flavored whiskey releases, Jim Beam Kentucky Fire isn’t under the Red Stag brand, which aside from the core Red Stag seems to be quietly phasing out. Instead, Jim Beam Kentucky Fire is clearly part of the core Jim Beam family and trumpets its base as “genuine Jim Beam Whiskey”. This shift towards reinforcing Jim Beam’s core brand is a smart one, and while Red Stag has served Jim Beam well over the years, this more centralized and core brand-focused strategy is a good one. 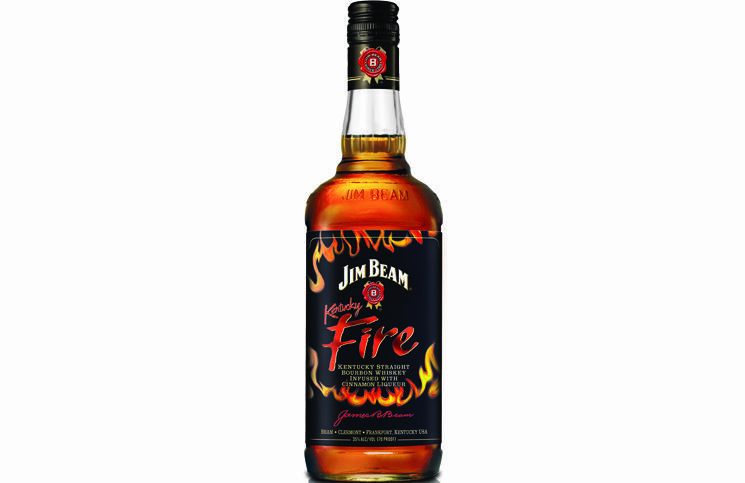 As with most cinnamon flavored whiskey, the “Fire” in Jim Beam Kentucky Fire refers to fireball candy, the space where most of the cinnamon flavored whiskeys play. The nose of Jim Beam Kentucky Fire indeed smells exactly like a fireball candy, with candied cinnamon as the primary note out of the glass. Beyond that, there are some subtle aromas from the base Jim Beam whiskey, including vanilla, caramel, light oak, and cinnamon (the non-candied kind). At 70 proof the nose isn’t very fiery, but it still manages to do a good job of delivering on the promise of a fireball themed whiskey. The entry of Jim Beam’s Kentucky Fire follows on the nose almost exactly with solid candied cinnamon spice. The entry is sweet, but not unbearably so, and it has an unexpectedly pleasant mouth feel. In addition to the candied cinnamon spice, there is a subtle sense of the base whiskey, but again it’s more vanilla and caramel than anything else. It’s really in the midpalate is where you get the fire of the cinnamon spice, and it’s entirely spot on. The spice level, balanced with the underlining sweetness, and addition of subtle whiskey notes are all exactly where they need to be for this kind of product. The finish is medium length and a showcase for the cinnamon spice which gradually peters off. At 70 proof, Jim Beam Kentucky Fire seems designed to be consumed as a shot, but there is enough flavor and structure (with the midpalate spice) to mix with it. As with Jim Beam Maple, Jim Beam Kentucky Fire shows just how good Jim Beam is with flavor innovation. Jim Beam has absolutely nailed the red hot/fireball flavored whiskey in a way that’s superior to Fireball. The big question is, does building a better mousetrap in this space equal success? Unfortunately, the answer is no. Fireball is a phenomenon, and even though Jim Beam Kentucky Fire is a better product, consumers in this segment of the spirits market aren’t looking for something better, they’re happy with what’s popular. For as seemingly adventurous as millennials are and how much they pride themselves on being “unmarketable” and “unique”, there hasn’t been a more conformist generation in recent history. The truth is Fireball is popular, so millennials drink Fireball. They Instagram it, hashtag it, and post it to Facebook. It’s extraordinarily difficult to compete with that. Although they are conformists, millennials are also very brand promiscuous, so Fireball’s fury might quickly come to an end, but what takes its place probably won’t be another cinnamon flavored whiskey. That being said, Jim Beam has done an exceptional job with Jim Beam Kentucky Fire – flavored perfectly, priced perfectly, packed perfectly, so now the questions is: is that enough?